We are pleased to release our new book, Revisiting South Africa’s Nuclear Weapons Program: Its History, Dismantlement, and Lessons for Today by David Albright with Andrea Stricker. It is the first comprehensive, technically-oriented history of South Africa’s nuclear weapons program and its dismantlement. The lessons of this dynamic and complicated nuclear weapons program remain valid today. Although none of the nine states that currently possess nuclear weapons appear on the verge of following South Africa’s example, the South African case contains many valuable lessons in non-proliferation, disarmament, export controls, and verification. A pdf version of the book is available on the Institute’s website. A pdf version is also available on the website of the Naval Postgraduate School’s Project on Advanced Systems and Concepts for Countering Weapons of Mass Destruction (PASCC). Ebook versions are available at Smashwords, Kindle, and Nook. A paperback edition (with only black and white photos) is for sale at Amazon. Twenty five years ago, South Africa acceded to the Nuclear Non-Proliferation Treaty after dismantling its nuclear weapons. Yet, the full story of that nuclear weapons program was not revealed publicly at that time, even after then President F.W. de Klerk revealed South Africa’s nuclear weapons program in 1993. Parts were hidden from the International Atomic Energy Agency (IAEA) as well. Now, after many years of work by the media and independent experts at the Institute for Science and International Security and elsewhere, and with the additional revelations and cooperation of a number of former members of South Africa’s nuclear programs, a much fuller picture of South Africa’s nuclear weapons program has emerged. Three generations of nuclear weapon production facilities are described for the first time publicly. The book includes many photos of these sites that were not available before. The book contains the first detailed chronicle of South Africa’s complicated struggle to make highly enriched uranium for nuclear weapons. It is a popular misconception that a change in the South African leadership, e.g. a form of regime change, was the key factor in making dismantlement possible. In fact, the historical record shows that South Africa’s perceived security threats diminished first and then an internationally-focused leader was able to make the decision to disarm. From an engineering standpoint, South African nuclear weapons were highly sophisticated and designed to be mated to advanced delivery systems, including a television guided glide bomb. At the end of the program, it had created the industrial wherewithal to mate a nuclear warhead to a ballistic missile. The South African nuclear weapon program explored, but was by no means rushing, to build boosted and thermonuclear weapons. Despite its recognized military and nuclear industries, South Africa depended on foreign procurements up until the end of the nuclear weapons program. The leadership of the South African Air Force sought to dramatically ramp up the nuclear arsenal and delivery capabilities for the 1990s, ahead of F.W. De Klerk coming into office and ending the nuclear weapons program. A closer look, based on declassified South African government documents, at South Africa’s nuclear strategic thinking, shows a government at conflict with itself over the question of whether South Africa would use nuclear weapons in a crisis or maintain them strictly as a deterrent. South Africa initially did not plan to disclose its nuclear weapons program to the international community and the IAEA. An evolution of thinking by South Africa’s new leaders and the IAEA, and intense pressure from the African National Congress, NGOs, and other governments, led to the acknowledgement that greater transparency was key to assuring South Africa’s neighbors that it had denuclearized. This process has valuable historical lessons for today’s proliferation cases. Despite establishing a policy of greater transparency in 1993, South Africa held back key details of its nuclear weapon delivery systems from the IAEA inspectors. It also was highly circumspect in describing its foreign procurements for its nuclear programs. This lack of disclosure in two key areas did not stop the IAEA from verifying South Africa’s nuclear disarmament. However, history deserves a fuller treatment, and this book seeks to contribute to that goal. At the Institute for Science and International Security, work on South Africa’s nuclear program goes back to its founding in 1992. One of its first projects was working with African National Congress (ANC) officials, who were interested in learning more about nuclear non-proliferation in anticipation of assuming key positions in a democratic South African government. This cooperation led to contacts with several former members of South Africa’s nuclear weapons program and a range of collaborative endeavors with them. It included two tours of the old nuclear weapons production sites. On the trip in August 2002, Albright was allowed to photograph the old nuclear weapon production sites before they were modified beyond recognition of their original purpose. Many of these images appear in the book for the first time. Revisiting South Africa’s Nuclear Weapons Program has relied on many interviews conducted by the authors in the 1990s and early 2000s with past members of the nuclear weapons programs and IAEA inspectors directly involved in verifying South Africa’s nuclear dismantlement. As well, we relied on a range of documents from that period, some of which we regret to state can still not be revealed publicly. The book is organized fundamentally as a chronology of the nuclear weapons program’s growth, maturation, and demise. However, it can be read out of order. For those interested in the details of the bomb program, we recommend looking at chapters, 2, 5, and 7. For those interested in the program’s dismantlement, see chapters 8-12. If nuclear weapons strategy is of interest, start with chapters 4 and 6. For those who are more technically inclined to the nuclear fuel cycle, and in particular highly enriched uranium production, see chapters 1, 3, and 12. Finally, for those interested in today’s lessons, read chapter 13. Although not every question could be answered, this history reveals a great deal of new information about the program. 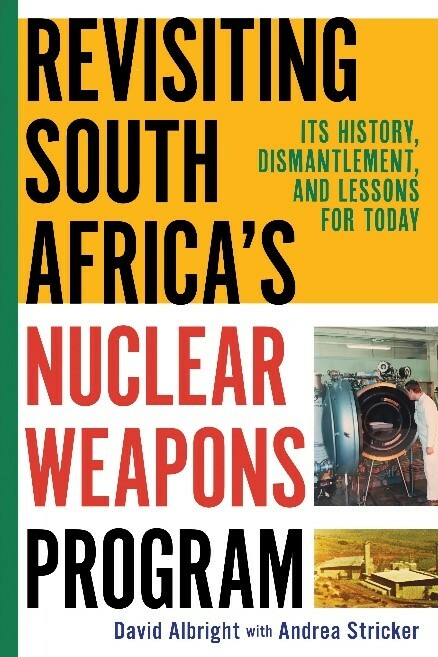 We hope that this book will be regarded as a useful contribution to policy debates and serve as a compendium of information on South Africa’s nuclear weapons program and its dismantlement. Revisiting South Africa’s Nuclear Weapons Program: Its History, Dismantlement, and Lessons for Today results from research supported by the Naval Postgraduate School’s Project on Advanced Systems and Concepts for Countering Weapons of Mass Destruction (PASCC) via Assistance Grant No. N00244-15-1-0005 awarded by the NAVSUP Fleet Logistics Center San Diego (NAVSUP FLC San Diego). The views expressed in this book do not necessarily reflect the official policies of the Naval Postgraduate School or imply endorsement by the U.S. Government. We produced multiple electronic and print versions of this book to allow it be viewed on several platforms. We want to especially thank 52 Novels for making this possible and Stewart Williams for designing the cover. We also funded the dissemination of this book so that we could provide electronic pdf and e-publication versions at no cost. Again, the pdf is available on our website, at PASCC, and also on the Homeland Security Digital Library. An e-book version is available at no cost at Smashwords and Nook. We have also posted the book on Kindle. However, the policies of Kindle do not allow for us to offer the book at no cost on its platform, at least initially. Finally, we produced a paperback version (with black and white photos only) that is available for purchase on Amazon.